American Motors' little economy package can be turned into a screaming performer! For example, check this incredible A/FX . . . Imagine a scene in the executive office of Mr. Roy Abernathy, President of American Motors Corporation. By invitation walks in Bill Kraft, dynamic Norwalk, California, Rambler dealer and entrepreneur of the 1964 Super Stock Rambler lines of Ambassador, Classic, and American "Rebels." Only Bill could know what anxious thoughts were ticking through his mind as he, the "racer," a supposed dire villain before this Wisconsin citadel of conservative "balanced performance" and "more usefulness to the user" slogans, took the last few steps. President Abernathy's face wreathed in a warm greeting smile as he looked at Bill and said, "Well, if it isn't Barney Oldfield from Norwalk!" And nothing could be more true. Bill Kraft's Rambler Ranch is the last lighted candle for those prospective buyers who admire the solid merits of American Motors automobiles, but just have to have those mag wheels, tachs, and big motors. In other words, we're talking about the typical youthful Southern California car buyer. The tach on the steering column and the floor shifter lever for the beefed Flash-O-Matic transmission reveal that this is no ordinary Rambler. Bill caters to this type of customer, as well as the more mundane Rambler buyer. His showroom bears a full compliment of the myriad 1964 models and body styles of the everyday "total excellence" fare. However! Over here there's a solid silver Classic two-door with chrome wheels, overdrive and tach; next to it is a specially painted American in "Mustang Orange," shod with Cragar mag wheels. Lurking outside is more tangible evidence of Southern California heresy, a 418-cubic-inch Rambler American! Surely a most potent slice of Wisconsin cheese! The factory's viewpoint on racing is well known: anything built for speed or performance is taboo, But Bill is certain that they "look out the other side of their cars on this thing," at least nothing has been done to restrain him from going racing. Surely a great protest would arise from numerous "Monsoon" owners in town if they did. The Monsoon was a Rambler Classic V-8 with mag wheels, metalflake top and other more racy endowments in a package which Kraft co-introduced this spring with the black and yellow 232-inch seven-main bearing six special edition car bearing the factory blessed title of "Typhoon." The wild performance and metalflake paint accounted for one customer even "trading up" from his 1964 Chevy Super Sport to a Monsoon and "a happier owner you've never seen 'cause where could you find it anywhere else?" laughs Bill. The factory feels that the horsepower race and factory sponsorship of racing is detrimental to the auto industry because of the high rate of freeway accidents linked directly to speed. All Rambler cars are powered proportionately, actually maintaining a power-to-weight ratio among the best in the industry. With balanced power and low weight, Ramblers consistently deliver the goods on fuel economy that few can match. The 418-cubic-inch engine is based on a Rambler Ambassador V-8 but has been stroked 3/4 - inch. Following normal drag practice, the battery has been placed in the trunk to dump more weight at the rear. To quote Bill Kraft: "The only thing the public doesn't know is that we've got one of the finest performance cars there is; the factory doesn't tell anybody though! That new torque command seven main bearing 232 six will outperform Chevy's intermediate engine, but people just aren't conscious of sixes; V-8's are synonymous with speed in the public's mind. I don't think people particularly care about economy; whether they save four or five miles per gallon. The swing is to power and performance. Our car will out perform the typical package purchaser's buy in competitive makes. They don't all go the '426' route! "I think the factory should make an aluminum A/FX for the people that want it, but I'll never live long enough to see it! American Motors is losing business by not promoting something we have. We need that aluminum factory experimental. But, the factory goes along with Mr. Abernathy, and who knows, he is maybe right! 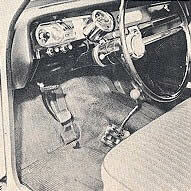 For all around usage and purpose, the twin-stick overdrive is a much more practical gearbox than a four-speed. The enthusiast, however, does prefer the four-speed box because of that real low ratio in second gear. The shift-command Flashomatic has been one of our big selling features. I drive it in my own car. It'll be optional next year on the American, along with a new 200-cubic-inch six." 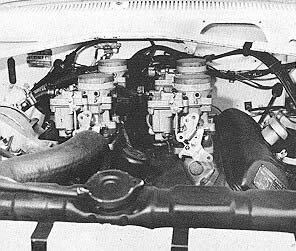 Four carburetors set atop a specially-fabricated intake manifold, while the custom headers are just barely visible from above. 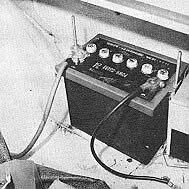 Engine changes include a transistorized ingnition and Isky 505-A cam. 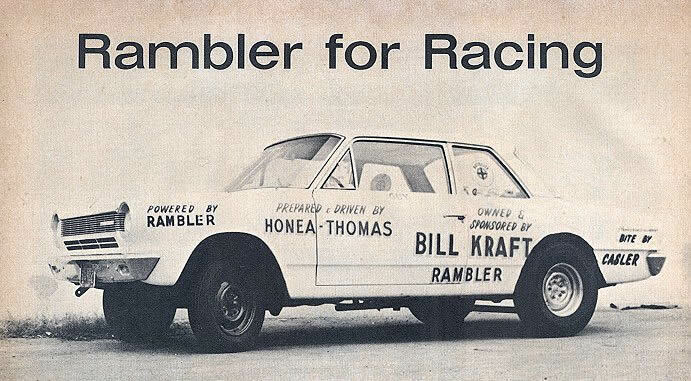 Not long ago the Rambler Dealers Association donated an Ambassador engine for testing by a leading automotive publication. After exhaustive research, the magazine's final verdict towards the 327's hop up potential was an enthusiastic "the sleeper of the industry!" A follow-up report featured Kraft's '63 Super Stock, a consistent winner at the old San Gabriel Dragway. Letters from Rambler enthusiasts across the nation began pouring into Bill's office, many asking questions about swapping Ambassador engines into Americans. Bill's engineers figured the big mill would fit into the American, but the factory wouldn't acknowledge the fact. He flew back to Detroit for conferences, the factory re-established its "No it Won't Fit" answer. "Well, I'm glad you told me that," bellowed Bill, "because we've already got one in, and it's running 112 at Fontana!" The big and terrible FX American next sought laurels at the NHRA Winternationals, but as Kraft puts it, "They blew us out of the tub out there. The inspection team wouldn't pass us because of the non-approved scatter shield. After an all-night effort to weld up a new one, we were again vaguely turned down; we concluded they just didn't want us to run." In street use, the 327 Ambassador equipped American 440 hardtop has torque that'll scare you, and its performance and handling are absolutely amazing. One of Detroit's major issues against the swap was fear that the front end would be too heavy, but for street driving all the 440 needs is heavy duty springs and shocks. Actually the big Ambassador mill weighs only 80 pounds more than the venerable 196-cubic-inch six! 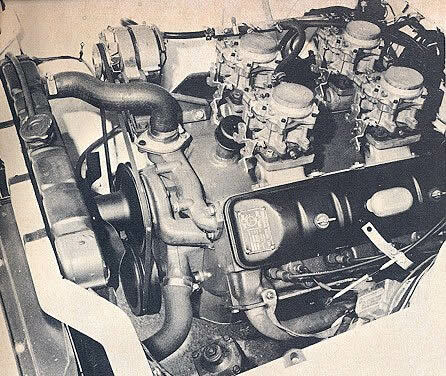 Bill Kraft makes himself known as the "one man crusade" to install the small V-8 as an option in the American line for 1965. After two days of banging away at 'em at the factory, the top brass intimated they just might tool up for such a package sometime in December, or after new model introduction is over. Of course, we're hoping they won't change their mind on it. Supposing you can't wait, the urge to drive an inspiring American like Bill Kraft's is all-consuming. You tool your "big three" sled out to the "Keith Black of Norwalk" and start to make overtures about Ambassadors in Americans and such non-sensicalities. Bill will take you out back, point out a gorgeous array of many hued Americans and say, "Take your choice." In this instance, dealer get-ready takes several days while the big Ambassador 327 is uncrated and dropped into the 106-inch wheelbase super-compact. The cost? A very fair $750 added to the list price. When Chevrolet V-8's in Chevy II's were all the dealer installed rage several seasons back, the tab reached 1200 dollars. Now a little confab with Guy Thomas, specialist in preparing these Americans with total performance overtones. Starting with an Ambassador 327-inch block, Guy's latest effort reaches skyward to up and over the 400 mark, 418 cubic inches of AMC motor! A 3/4-inch stroker kit nets the Rambler a four-inch "arm." Pistons are special order 12-to-1 Ansen items, .060 over. Ed Iskendarian supplies a wild 505-A cam, the four carb manifold is home-built, and the heads show diligent preparation. Guy favors Autolite plugs, transistorized ignition. At this writing, a beefed Flash-0-Matic has survived some tentative reaches towards 120 mph, but intermediate range is hard put to take the added punch; it's been dropped once. A four-speed is the answer, and if one can be fitted, naturally a Schiefer clutch and flywheel will follow. The suspension is also beefed (heavy-duty springs, shocks), but there's been no weight alteration attempted to improve transfer. Traction so far has been no problem, with a 4.89 gear and 7-1/4-inch, 8.00 x 14 Casler slicks the machine leaves the line smoothly and drives itself through the traps. 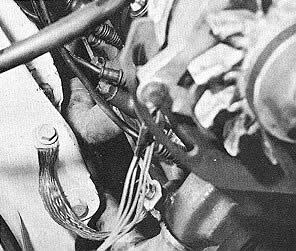 Internal modifications in the presently used Flash-O-Matic include heavy duty Ford clutches (all bronze), main line oil pressure increased to 28 pounds, and standard seals, which will work if "real carefully put together," warns Guy. Shift points have been raised to where 7500 rpm is attained without stress, 8200 with a little strain. When going to an Ambassador Flash-0-matic and big engine, Guy recommends a Ford half-ton pick-up driveshaft shortened 4 3/4 inches. He has the yokes electric-welded, the shaft completely re-balanced, and Ford universals adapted to the American scheme of things. The rear end gear set is part Studebaker, part Rambler American. In 327-inch, single four-barrel form, the stormin' little economy-oriented car has proven the match for such missiles as the 260-inch Falcon Sprints, and the sundry variety of modified 327 Chevys found out Fontana Drag Strip way. Indeed, 111-mph times turned in by this mild-not-wild combination using only 4.10-to-1 gears to call its own, pumped the crew up so much things just naturally led to the current, but not yet tried "418-two-fours-4.89" all-out A/FX race car. Bill Kraft loves racing; he likes it under supervised conditions found only at drag strips. He's been a Rambler dealer since 1955, devoting himself to carrying on a personal vendetta to show the public, "That we've got a lot of hidden value in this automobile," and he'll continue this program, even if it means going to a supercharged challenge, to the Ram Chargers, or possibly the world's first injected Rambler C/Fuel dragster!